"At the end of this day, one shall stand, one shall fall!" I was as excited as any self-respecting child of the '80s when it was announced that Transformers was going to be made into a massive, summertime blockbuster. Of all the cartoon properties I loved as a kid, it�s hard to imagine one that lends itself as naturally to the Hollywood makeover process as Transformers. After all, it just takes a few talking, transforming robots and a lot of explosions stay faithful to the line of toys which served as the basis of this film. And I was wrong. I don�t have much love for Michael Bay and I�m still certain that a better filmmaker could have done this script even better, but when it comes to action and spectacle there aren�t many people who work better than Bay. Sadly, with said action and spectacle comes a gutterball of lame humor, unnecessary subplots, and a script that always feels like it needed another polish or two. Seriously, Michael Bay is his own Yin and Yang. I�ve always felt that way, but you�ll never see a better example of what I�m referring to. A movie that�s so good and so terrible all at once. You see: I love the robots. I love the spectacle on display here. It�s fun, imaginative, the stuff that invokes the kid in all of us. When it works, it�s movie magic at its absolute best. But there are just too many detours that temporarily displace all that fun stuff. Most of the time it comes in the guise of unnecessary characters: John Tuturro, Rachael Taylor, Anthony Anderson, Jon Voight, Kevin Dunn, and Julie White. For a movie about giant robots from another planet, it sure likes spending time with its superfluous supporting cast � all of whom could and should have been cut from the final product. At times it often seems like Michael Bay is going out of his way to avoid any sense of depth in his films and again, this is no exception. He misses several opportunities to allow us to know the core characters (probably because he�s too busy cutting back to the aforementioned secondary cast), opting instead to give us a Cliffs Notes version of character development. Look at the scene where Sam (Shia LeBouf) drives Mikaela (Megan Fox) home. We cut from their awkward introduction to her being dropped at her doorstep where all she can say is: �thanks for listening.� But it never occurs to Bay that we, the audience, might have some interest in actually listening too. Give us some reason to care about these characters, pal. My least favorite thing about Transformers stems from one moment that just completely rubbed me the wrong way. I�d been looking forward to taking my nephews to see the movie for sometime. I thought it would fun to introduce them to something that I enjoyed very much at their age. Besides, it�s giant robots. What kid isn�t going to love that? And it really just bugged me when the filmmakers felt the need to include a moment where Sam�s parents point blank ask him if he�s been masturbating in his room. It�s a crude bit, a little more obnoxious than most. I can deal with the profanity but what if a parent doesn�t want to be forced into explaining to their child what masturbation is while walking out of a giant robot movie? I'm not puritanical in any way, shape or form, but that's a tasteless bit—more than a little out of place in a film based on children's toys. We can talk a little bit about the robots, I suppose: every second they�re on screen the film becomes the stuff of thrilling spectacle. It somehow dwarfs the shoddy storytelling practices that cripple every Mike Bay production. Honestly, those robots are just that cool. But that leads me to another problem: why aren�t we spending more time with them? Maybe it�s because Bay wasn�t sure how the audience would react to those characters, but you know what? Have some confidence in your source material. Michael Bay certainly is a successful filmmaker but he lacks the real innovation to be considered a great one. For some reason though, I think he can live with that. What ultimately makes Transformers a success for me, however, are the little touches. Certain bits of dialogue are taken directly from the '80s cartoon that was such a prominent fixture of my youth. When I heard it on the big screen, I couldn�t help but grin. 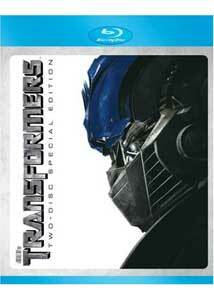 There�s also the casting of Peter Cullen as Optimus Prime. Cullen, as most of you know, voiced Prime in the cartoon. To hear him play Prime again with adult ears � it�s a special bit of nostalgia. Transformers isn�t consistently good, but there�s plenty of things to like if you�re willing to overlook the utter nonsense that clutters the downtime. If the spectacle of giant warring robots is enough to win you over, then it�s absolutely worth a look. I had a great time, warts and all. Image Transfer Review: Transformers is all over the place in terms of its visual palette. From the desert to suburbia and including the full-on destruction of several city blocks at the conclusion, this is a busy film. Paramount's Blu-Ray brings it to home theaters without the slightest of issues. Flesh tones are natural and textured (Megan Fox in HD is a sight!) while shadows are rich and detailed. This disc even showcases the integrity of the CGI-laden action by revealing textured effects work that blends seamlessly with the live-action performers and backgrounds. Paramount nailed Beowulf and this title is every bit as incredible. Audio Transfer Review: Unexpectedly, your home theater is going to get a workout when playing this disc. The opening action sequence in Quatar sets the pace quite nicely by filling your front and rear speakers with halos of gunfire while your subwoofer pumps out consistently punchy bass. Occasionally some of the quieter scenes tend to level the dialogue a little bit on the soft side. Believe me, it's not a big deal and it only happens a few times, but it's just enough to warrant a mention. Beyond that you won't be disappointed by this track. It's wild, full-bodied, and almost non-stop. A near-perfect mirror to the superb video quality. Extras Review: One thing I love about Paramount is their insistence on presenting all their Blu-Ray extras in HD. Transformers is no exception. Here the content is strewn across two discs and the extras are a nifty collection. There's a lively commentary track with Michael Bay. I might have let it slip that I'm no great fan of Bay, but I might just be coming around. In his talk here he is funny and likeable and demonstrates his passion for the filmmaking process time and time again. By the end of it I was tempted to reconsider my stance on Bay. Almost. The picture-in-picture track is a bit of a bore, sadly. It's a bit of glorified trivia track that offers some forgettable factoids about the production. Nothing too special here. Disc 2 is loaded with groovy documentaries. First up is Our World (49m:20s). It begins with a brief history of the classic Hasbro franchise and springs to segments on casting, military authenticity (? ), and action sequences. The second documentary, Their War (1h:05m:13s), is even better: it's an extensive look at recreating the Transformers from the '80s to today. Things get a little less compelling once we move onto the technical process required to give life to the robots, but it does help to illustrate the amount of work and research that went into producing this blockbuster. More than Meets the Eye(17m:41s) covers some additional behind-the-scenes action footage and some newborn animatics. Nothing special, but worth a look. Another Blu-Ray must own! Paramount has packaged a fun film with a boatload of extras (most of which are in high def) with another reference-quality disc. The film's a lot good time in the right frame of mind, too. These are the types of films Blu-Ray was made for and, with that perspective, I can't recommend this one enough.